I have lived in Texas the majority of my life (I say majority, but I should say practically all my life- since I was 4). One of the things you get used to when you live in Texas is triple digit summer months and 800% humidity. And I don’t know if you really EVER get used to triple digit temperatures and 800% humidity or if you just learn to deal with it. Normally the scorching temperatures don’t start until July or August but this summer June 13th was the starting point (I remember the date so vividly because the weather man here reminds daily at 6am, 5pm, 6pm, and then again at 10pm). Living in Texas and having killer heat waves means you have to learn to adapt. If you must venture outside you DO NOT do it in the hours between 8 am and 8 pm because you run the risk of melting; and if you do venture outside during those hours you jump in the pool immediately- clothes and all. You budget for electric bills that are hundreds of dollars, you walk around in little or no clothing (you can defiantly get away with this one if you live by yourself or are members of a nudest colony), the AC is on full blast in your car, work and home. Your AC repair man’s phone number is on speed dial just in case the damn thing starts acting funny you need to make that ’emergency’ phone call because you cannot live without that thing (remind me to bow down and kiss the feet of whom ever invented the AC-genius pure genius). Unfortunately in the hot Texas summer months your diet becomes cold/frozen foods, and to stay hydrated you must drink liquids by the gallon. Turning on the oven for long periods of time becomes a death wish (especially for your wallet because using your oven means your AC works harder, which means you and your wallet pay for it). Because of these uncomfortable living conditions I have been avoiding my kitchen- eating out (let someone else pay the high electric bill) or eating stuff like sandwiches or cereal (I know not very interesting or chefy, but man those triple digit temps and the humidity)! Boil 8 cups of water. Pour boiling water over tea bags, add honey and let sit until water cools down. When water is cool, or no longer hot, add thawed juice concentrate, sparkling water, and the juice from the lime and orange. Pour into ice cube trays and freeze for several hours. 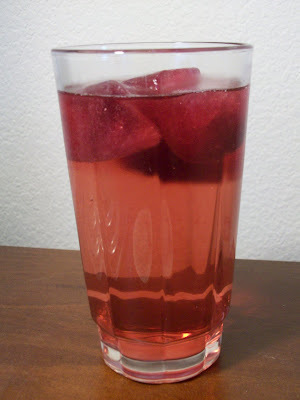 Place 3-4 juice ‘ice cubes’ into a glass and top with lemon-lime soda.